Starting Monday, more cars will be added to accommodate growing ridership on Metro’s Expo Line, which has been embraced by commuters, beachgoers and fans attending USC and Rams football games at the Coliseum. 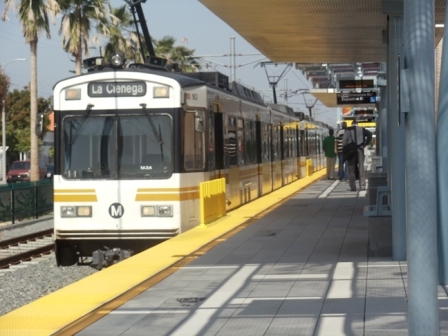 The light-rail line was extended from Culver City to Santa Monica in May, with trains currently arriving every 12 minutes. The line originates at the 7th Street/Metro Station in downtown Los Angeles. The additional cars will bring the weekday wait times down to every six minutes until 8 p.m., after which trains will run every 20 minutes. Weekend frequencies will be every 12 minutes until 9 p.m., when it becomes every 20 minutes. The Expo Line will go from nine trains with two cars each to 18 trains, each with two cars, which will increase capacity by about a third. Once more light rail vehicles become available, the 18 trains will be steadily upped to three cars each, according to Metro.